Paper Production - Hydro-Thermal Corp. Ensuring your plant is running as efficiently and reliably as possible is critical to survival in today’s global marketplace. Hydro-Thermal heating systems will maximize your uptime with their minimal maintenance requirements and high reliability. Our precise temperature control and non-scaling operation will improve your product quality, ensure consistency and production efficiency. Replace your sparging system today and experience the best in inline heating. Hydro-Thermal’s technology works by mixing steam and process liquids completely while delivering consistent temperature and instantaneous heating. 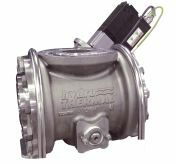 For more information on our advanced direct steam injection technology, click here. The type of heater you need is dependent on how it will be used. 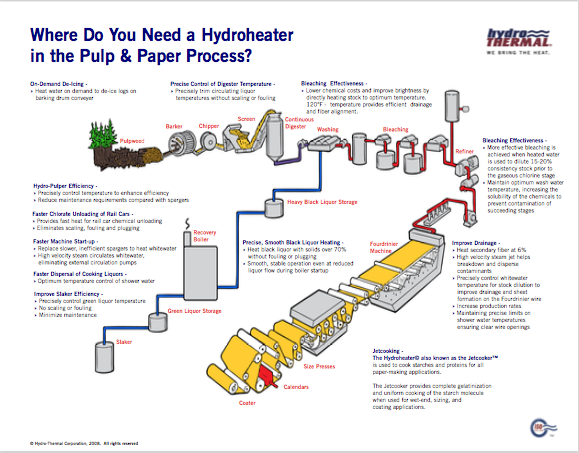 No matter what your application, Hydro-Thermal has the solution for every application in the paper production area. Venturi pumping effect of our Hydroheater design allows for simple installation, utilizing inline heating to avoid steam hammer, tank damage, and energy losses associated with sparging. Whitewater or any process water used on the paper machine, can be heated by Hydro-Thermal technology. Hydro-Thermal can help you maintain or increase water temperature. Achieving higher water temperature (ideally 120-140˚F) can improve drainage on the wet end of the paper machine which ultimately increases machine speed. In addition, higher temperatures can improve water removal in the press section of the machine, and reduces bacterial growth. Effectively mix large quantities of steam for rapid temperature increase of entire whitewater system, including header overflow, screen rejects, or seal pit return. Improve production efficiency and sheet quality. Felt and wire showers benefit from tempered water for improved cleaning and elimination of temperature stratification. Head box and other roll showers benefit from heating/tempering water to match whitewater temperature. By having uniform temperature that matches whitewater temperature, there is a consistent temperature profile on the machine. In turn, the machine runs more consistently which increases production quality. Reduce pulping time or eliminate the need to sparge into pulpers during operation by preheating fill water for repulpers. Improved contaminant removal and enhanced dewatering are also benefits. Most repulpers require heat to break up bails and wastepaper. Preheating is more efficient, because it will improve repulping time while avoiding direct sparging into the repulper. Water heating is at the core of Hydro-Thermal’s applications, because precise and consistent temperature is a crucial part of manufacturing especially in the processing of paper. Many types of starches can be processed with inline cooking for size press, wet end, and coating starches/slurries. Complete systems can incorporate automated flush and preheat cycles, cooked and final starch solids control, hold tube retention time, and back pressure control. 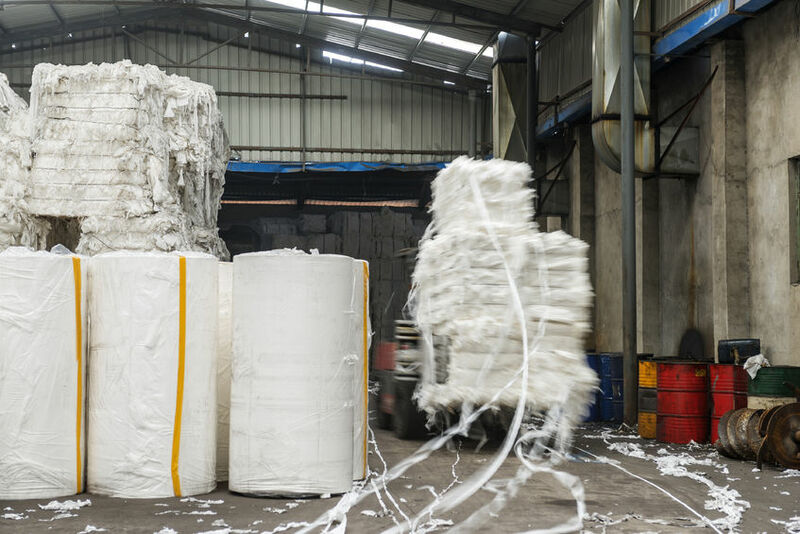 Hydro-Thermal’s technology allows paper manufacturers to use continuous or semi-batch processing compared to the traditionally used batch cooking. Exact temperature produces a quality starch cook that provides uniform and consistent results. Ultimately, sheet properties, coating quality, and surface quality are all improved. Click here to learn more about starch applications.